This didn’t make it into today’s Herald, so here it is – a round-up of news from the “other” sports – a football-free zone. TAEKWON-DO: Ellen Ince proved the hero of the Irish Taekwond-do team when she successfully defended her 55kg junior sparring title at the World Taekwon-Do Championships in Jesolo, Italy. Ince, a member of the Rivervalley club in Swords, beat Jenny Gluck of Germany for the title – her fifth fight of the tournament. In the junior 56kg men’s sparring final, Luke McGrath ended up beating his Irish and Rivervalley team mate Rostick Ivanchuk for the gold medal. There was also gold for Ireland in the junior 62kg section won by Dylan Murphy of Cork Taekwon-Do. Senior middleweight produced another all-Ireland showdown, with Adam Shelley of Killester TKD narrowly beating the defending champion Dylan Fitzgibbon of Elite Martial Arts Academy, Cork . In patterns, Stephen Ryan of Quin took silver in the 4-6th section. The final medals of the week went to the senior men and women’s sparring teams. 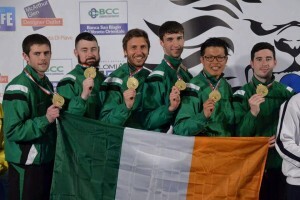 The senior men’s team of Darren Smith, Stephen Smullen, Hong Looi, Richie Forde, Adam Shelley and Dylan Fitzgibbon beat Ukraine for the world title, while the women took bronze. 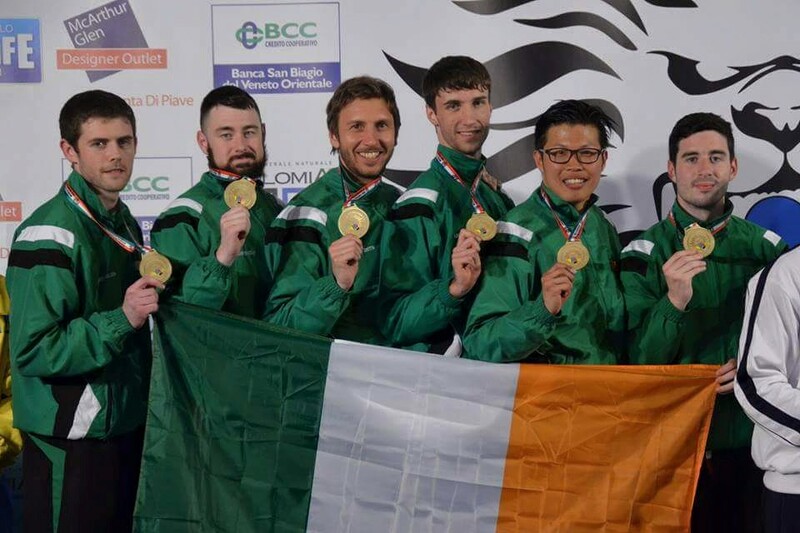 In further good news, the Irish bid to host the 2017 World Championships at Citywest, Co Dublin proved successful. CANOEING: Four members – including a brother and sister – from the Salmon Leap club in Leixlip have made the Irish canoeing team for the Baku Azerbaijan European Games starting next week. Leading the team is Jenny Egan, who recently took a bronze medal for the 5000m at the European Canoe Sprint Championships. She goes in the K1 200m, 500m, and 5000m. Egan’s brother Peter pairs up with Simas Dobrovoloskis in a K2 boat for the 200m, while Peter also races the K1 5000m. The fourth Salmon Leap member is Tom Brennan who competes in the K1 200m. 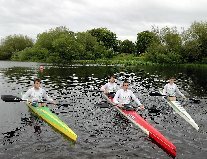 Irish Olympian Andrzej Jezierski from Argonauts Cork competes in the C1 200m. TENNIS: Entry for the second annual Irish U23 Tennis Open starting at Sutton LTC on Monday June 15 closes this weekend. Thanks to generous sponsorship, the tournaments offers a prize pot of €6,400 with the singles winners collecting €700 each. The two singles events are limited to 32 players with 16 pairings in the doubles. Last year’s winners were Osgar O h Oisin and Aoife Tonna-Barthet. Rob Cherry beat top seed Stephen Taylor to win the men’s over 35 singles at the Irish Open Veteran Championships in Templeogue. In the women’s over 35 singles, Linda Lawlor came out on top after a tough three-setter against Ashley McVeigh. HOCKEY: Places on the Irish team for the men’s World Hockey League 3 are at stake when the Irish play two final warm-up matches against Belgium this weekend. Belgium, world ranked No 4, are top seed in the pool the Irish will play in at the World League 3. Venue is the KHC Dragons grounds which will host the World League 3 starting on June 20. Irish players Kyle Good and Shane O’Donoghue are both familiar with the stadium having played with the Dragons over the past season. Back in the 20-man squad for the series are Three Rock Rovers pair Jonny Bruton and Mitch Darling. Matches take place today and tomorrow, both starting 2pm Irish time.